View her cute video here! Also, below is a little clue to the BEST deal of the week. Smith’s is selling a pound of butter for $1.67 (sale ends January 29th) . You can’t beat that! That’s 44% off of Walmart’s already reduced prices (regularly $2.98 a pound). I had a hard time not filling my entire freezer with butter. Butter and brown sugar….my two favorite things in my storage 🙂 To save money later in the year, make sure and buy up as many butter’s as you can get your hands on (and afford of course). Happy shopping!! Login to our website to see all of this week’s deals–there are some GREAT deals on many name-brand, food storage items that should be added to your food storage this week (canned beans, canned tomatoes, canned fruit, sugar, snacks, chips, pasta, pasta sauce, and MANY more!) Save $100’s a month by knowing exactly which items to purchase, how much to buy, what to stock up on and make our delicious meals this week with all of the items on sale. I have a question. In Walmarts price match policy it says the item must be the same (size, brand, color etc) so how did you ad match so easily? When I try to ad match it seems like they don't carry the same brand, or if they do it is a different size (like they don't carry 4lb sugar) or if Albertsons has their butter on sale, I can't ad match at Walmart because they don't carry Albertsons butter. Can you help me out? Does your store have a different policy or are you not matching like that? Thanks! I have never had a problem ad matching butter. Same thing with meat veggies anything. I went to the Smith's by my house and they did not have the butter on sale. There were also a few other items they didn't have on sale. They would not honor the items on your grocery list. First time I've seen a decrepency. I apologize! 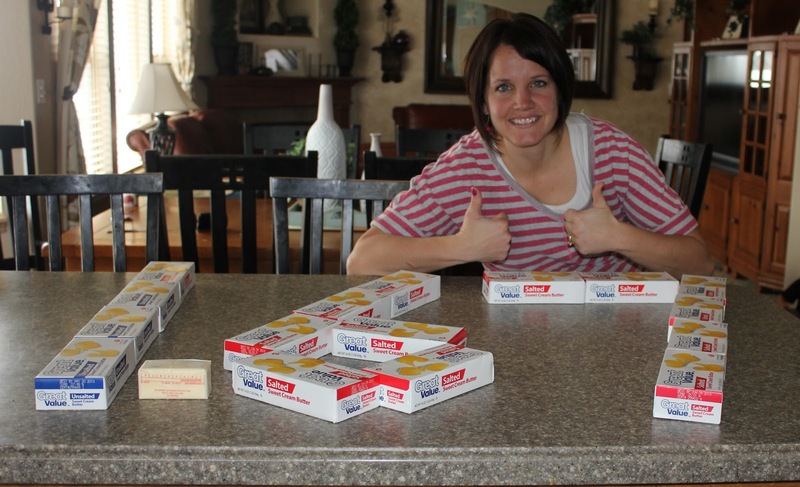 I posted this butter sale Friday of last week when the butter was on sale at Smiths. This Wednesday Smith's started a new ad and sadly it wasn't on sale. I'm sorry you didn't get to take advantage of that sale. Hopefully it will come again soon! Sorry about the confusion. It probably didn't help that that picture was in our most recent newsletter, since the newest posts automatically get added to our emails, even though that sale was over. Sorry about that! Thanks for the help. I will try it!